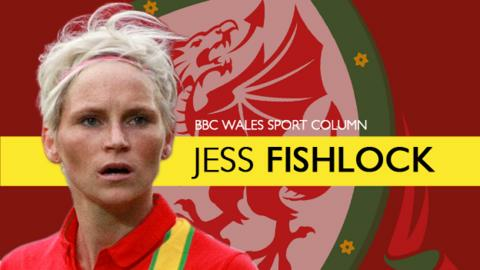 In her latest column for BBC Wales Sport, Wales Women and Seattle Reign midfielder Jess Fishlock reacts to the 2017 Women's European Championship qualifying draw and talks about her return to the national squad for the recent friendly matches against Slovakia. We can be excited by the draw for the 2017 Women's European Championship qualifiers and we have a chance to qualify for the finals in the Netherlands. Wales have been drawn in the same group as Norway, Austria, Israel and Kazakhstan and although it's a tough draw for us it's one we can be positive about. It's important we get a good start because the momentum it gives you is crucial. There are top-seeded teams we would have preferred other than Norway and it's going to be very difficult against them. They have been trailblazers in the past - World Cup winners in 1995, Olympic gold medallists in 2000, two-time European champions and runners-up two years ago. But I wouldn't say they are quite at that point right now. It's up for us to prepare for them and give them a shock. We have to make sure we are ready for this group. Manager Jayne Ludlow's building a squad that will test any team and it's the perfect opportunity for us to show that. It was good to be back in the Wales set-up for the recent friendlies against Slovakia in Bangor after being left out of the squad for the Istria Cup tournament in Croatia. I love playing for my country and it was a great feeling putting the kit back on. I'm looking forward to working with Jayne again in the future. It was vital we played those games and Slovakia have been a difficult side every time we've played them. I was involved in the first game on Easter Monday and there were plenty of positives to take from the 1-0 win. We created a lot of chances, kept a clean sheet and played some really nice stuff. But the downside of playing back to back games is that you can become tired and your opponents then know more about you. As much as that is difficult it's also good for you to see how you can adapt and how you can change in that timeframe. I couldn't stay for the two games because I had to return to the United States for the start of Seattle's season. But from what I've heard there were a lot of positives to take from that game as well, even though we lost 2-1. It was a very good camp and we took a lot from it. There's plenty to work on but plenty to be positive about. It was vital we had those games ahead of our European Championship campaign as there are no Fifa dates before September because of the World Cup finals in Canada. That makes it extremely difficult for teams not involved in the World Cup to prepare because clubs don't need to release players. Seattle Reign have won one and lost one in their opening two games of the National Women's Soccer League season. We've been pleased with Seattle's start to the season in the National Women's Soccer League. We won 5-1 against Western New York Flash in our opening game of the season, which was brilliant for us. But we lost 3-2 away to Chicago Red Stars in our second game. Chicago is such a difficult place to go. You have to fly four-and-a-half hours and then there's the time difference. Their pitch is a very difficult place to go and play and we've never beaten them away in three years. It's one of those places where we've really struggled to play. Losing there wasn't a great result but it's early days in the season and we're confident moving forward. I was extremely disappointed that my Wales team-mate Natasha Harding's move to Washington Spirit fell through after she was denied a visa. I feel it would have been great for her to have played in the United States and her game would have improved and she would have enjoyed it. I told her how sorry I was about the situation but she's at Manchester City now and enjoying it there. It's another challenge for her.